Our Perfectly Imperfect Life: Megan Massacre, one of the most popular tattoo artists and reality TV stars with starring roles in TLC's NY Ink and America's Worst Tattoos, brings her wildly popular art style to a coloring book. 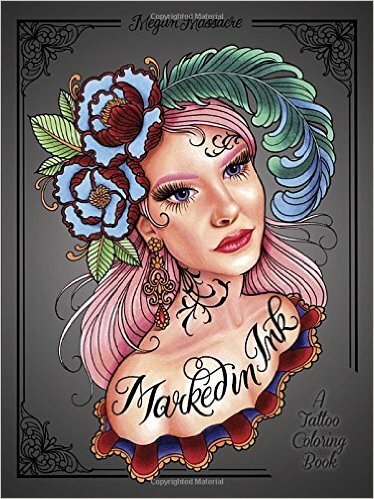 Megan Massacre, one of the most popular tattoo artists and reality TV stars with starring roles in TLC's NY Ink and America's Worst Tattoos, brings her wildly popular art style to a coloring book. Tattoo artist Megan Massacre invites adult coloring book fans into her whimsical world of sugar skulls, sailing ships, mermaids, owls, and more. Now you can add your own bold, vibrant colors to her signature edgy and artistic tattoo designs--and tear each perforated page out for display! I absolutely LOVE this book. It is so very detailed...and I admit, I think this might just be my new favorite coloring books out of all that I currently own. The paper is very high quality, and I really like that the artwork is only on the front of the page, that way you can use markers if you wish and it won't bleed through. This is a great book for adults, but as well as older children(I'd say about 12 yrs and up).